As part of the monsoon series, today I will be reviewing a face mask which is very apt for this weather and helps in skin lightening too. Firstly, I have to confess that I am addicted to face packs and masks. I always have a huge collection of them at hand and like to use any one as per my mood 😛. My mom always scolds me for trying out all these stuff. But I argue that face packs are just a part of grooming. Just like washing your face everyday to keep it clean, you need a weekly deep cleansing session to keep your face free from those nasty blackheads, whiteheads, acne and tan. Let me know if you would like me to do a detailed post on skin care. For now let’s move on to the review. Dull, dark and dehydrated skin is common during the monsoon. Here is a natural face mask with ayurvedic formulations to give you a radiant and glowing skin this monsoon. Extracts of Red sandal, Saffron, Turmeric, Neem, Tulsi, Licorice, Nagarmotha, Amla, Mulberry, Papaya Enzyme, Sorbitol, Potassium Sorbate. 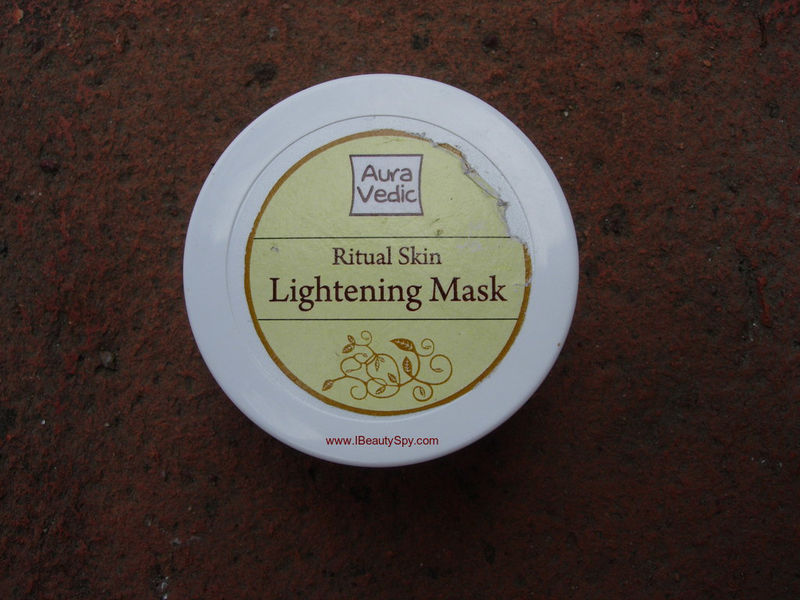 Cleanse face before applying this skin lightening mask. Keep it on for 15-20 minutes before gently washing off with water. Use daily for maximum results. 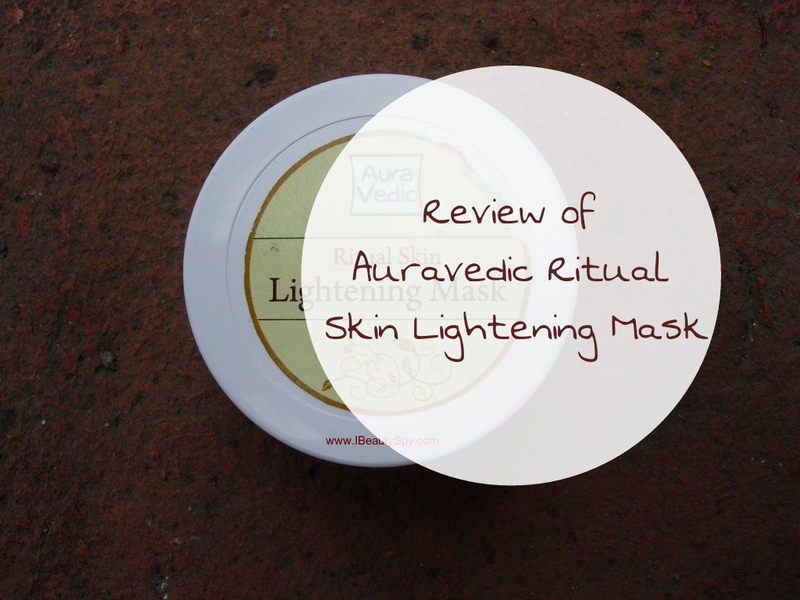 I have read a lot of good reviews on Auravedic products, in particular their Skin Lightening Oil and this Ritual Skin Lightening Mask, and so wanted to give it a try and see. I like to use only natural, paraben-free products in my routine and Auravedic products are all paraben-free and sulphate-free. Plus they are very affordable compared to the other natural brands. So you can easily build your skin care routine with all natural, ayurvedic products without burning a hole in your pockets. The face mask is light yellowish in color and looks like kulfi in a pot 😛. I love the color and texture of it. It has an ayurvedic smell but not very strong or bothersome. The consistency is medium and it spreads easily on the face. I keep it on for around 20 minutes. There is a mild tingling sensation but not much. In fact, it is quite soothing on the face after some time. It doesn’t dry out and tighten skin like other clay masks. Even after half an hour, it is still wet. It gets washed off easily. Coming to the results, my skin was visibly lightened, that is, tan removed and bright, radiant skin. It also deep cleansed my pores and my skin was looking fresh and clean. There was no dryness rather soft and smooth skin. Regarding its claims of reducing dark spots, I didn’t notice any effects initially. But with continuous usage of around 3 weeks, I could see some of my dark spots had faded. They have mentioned to use daily for maximum results. But I used it only once a week. Maybe if used daily, you can see faster results. 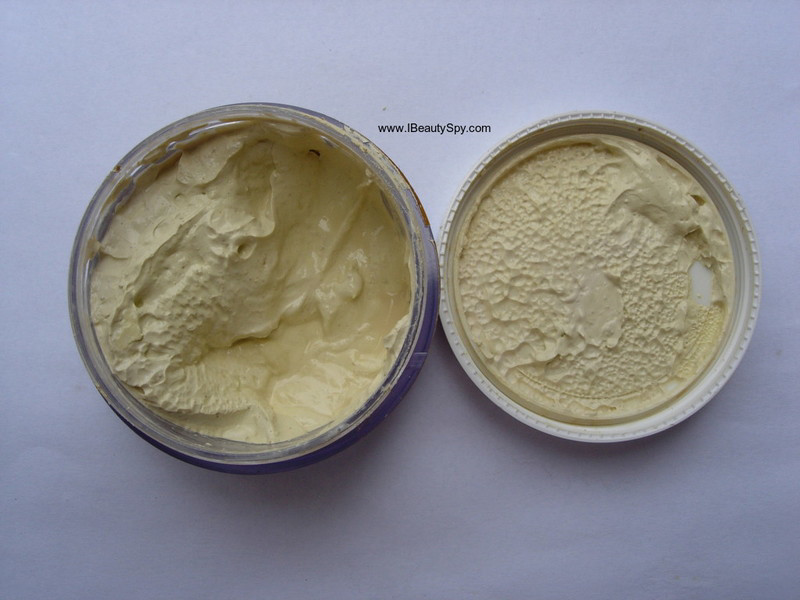 One tub comes for around 15-20 uses depending on whether you apply thin layer or thick layer. So I think it is very affordable for the quantity provided. 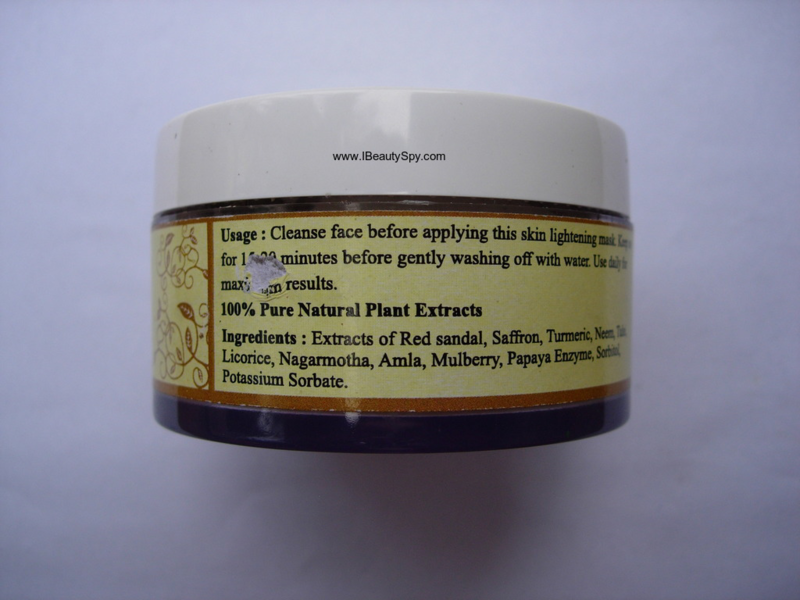 The face pack is suitable for all skin types whether oily, combination or dry skin. Even sensitive skin people can use this as I have very sensitive skin and haven’t faced any irritations or redness. * 100% natural extracts with ayurvedic formulation. * Easy to spread and apply. * Lightens skin and removes tan. * Gives bright, radiant skin. 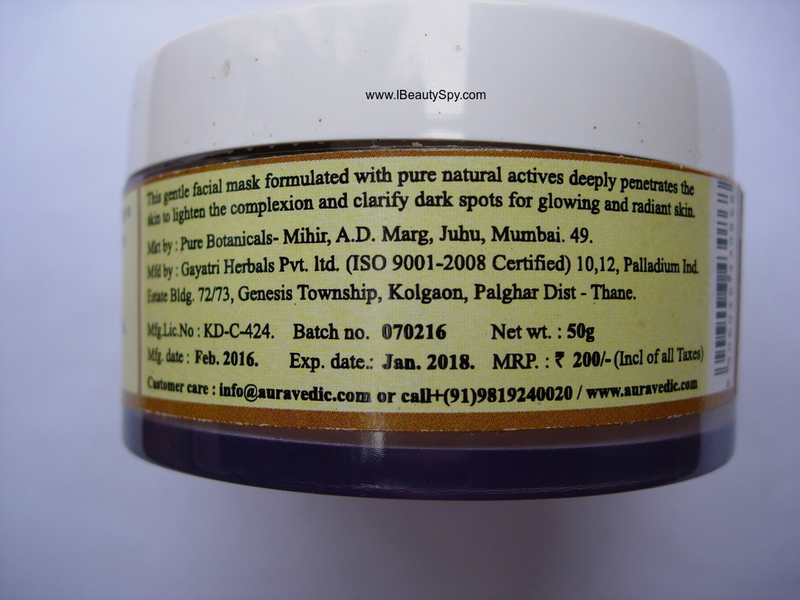 * Helps in fading dark spots to an extent. * Affordable and value for money. Yes, definitely, I would recommend it for all skin types. Yes, its very affordable considering its a 100% natural, paraben-free product. I am seriously in love with the Auravedic Skin Lightening Face Mask. Though I have a huge collection of face masks currently, I find myself reaching out for this often. Am going to try more Auravedic products soon. I have already reviewed Auravedic Aloe Vera Gel which is one of the most affordable and 100% natural aloe vera gels available in the market. Do let me know which Auravedic products you want me to review next. Have you tried any products from Auravedic? Do share your experiences with them. I purchased it for around 180 from amazon and it’s very useful product..
Looks like a great product.Would love to try it out. I have heard many good things about this mask. Will be trying it soon! Maybe in next few months. I have so many masks to finish at the moment. 😁 Great review! I totally love this mask from Auravedic. Truly delivers to its claims.